PIN - SARAH COVENTRY. 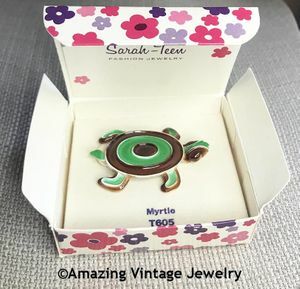 "MYRTLE" FROM THE 1967 SARAH-TEEN LINE. FLAT, COLORFUL ENAMELED TURTLE. 2 1/8" LONG, 1 1/4" ACROSS. EXCELLENT CONDITION IN THE ORIGINAL BOX ON THE ORIGINAL CARD.